To sign up and take part in the Open Day please email Irina Stancheva (523.glassart@gmail.com) by 20th of April and let her know your name, studio number and whether you are planning to: help organise the event, open your doors, run a workshop tester etc. Please remember, you MUST have your own Public Liability Insurance (through your A_N membership or similar) and updated risk assessment form by 27th of April. I started Wild Cat Crafts in 2014 following redundancy after 20 years as a property manager. 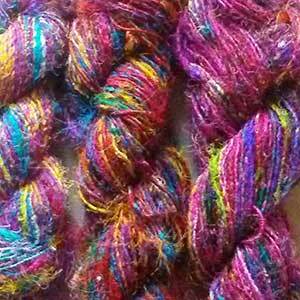 I have had great fun and learnt a great deal by trying a variety of crafts over the last 5 years. You definitely need to diversify when you run your own craft business, so this year I have decided to focus on weaving and quilting with some enamelling on copper and a bit of woodturning when time allows. That’s still quite a mixture, but I suspect that once I have invested in a new floor loom later this year, weaving will take priority! I use upcycled materials in my weaving (yarn made from sari silk is a particular favourite at the moment), quilting (I’ve just finished two quilts using denim jeans) and woodturning (offcuts of plywood glued together create beautiful “grain” once they’re turned). 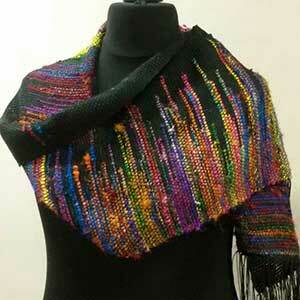 I also run knitting and crochet workshops in my lovely studio at St Margaret’s House. Lorna Sinclair is a Scottish artist who currently lives and works in Edinburgh. 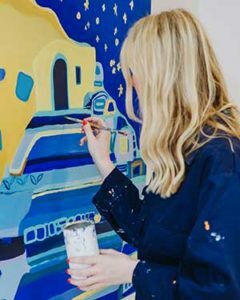 After graduating from Duncan of Jordanstone College of Art and Design with a BA(Hons) in Fine Art in 2017, Lorna re-located to Malta for a year. This move greatly influenced her creative practice; majestic landscapes, historical buildings, a Mediterranean colour palette and new faces, were all incorporated into her paintings. 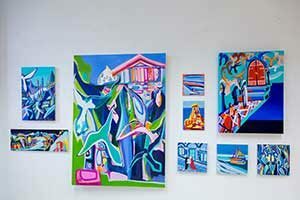 Self-reflection is an important element in Lorna’s work; her paintings become her own visual, personal journal of her travel experiences and memories. Working from a collection of photographs, sketches and memories, Lorna often merges images and scenes from her travels to form one final piece of work. 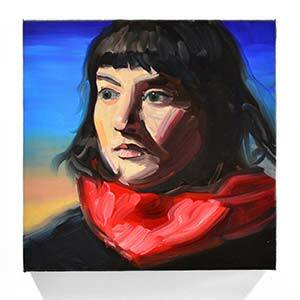 Her bright, lively paintings become an extension of her own identity. Through her artwork, Lorna attempts to offer a sense of hope and escapism, as she invites the viewer to share in a new reality – one she has created. We are looking for an artist to join us in our painting studio. 3 window space which easily accommodates 3 people. 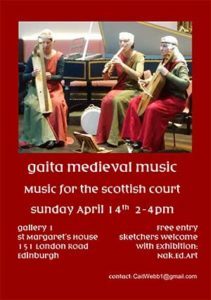 Music for the Scottish Court at St Margaret’s House. Gallery 1, Sunday 14th of April 2pm – 4pm, free entry. Sketchers welcome, in conjunction with Nak. Ed. Art. Exhibition. This is the 83rd of these pop up portrait sessions from over the last few years. Thursday 11th April, 6:30pm – 8:30pm £3 admission. 3rd Floor Gallery Space, St Margaret’s House. We are delighted this time to have the son of Reggie McAndrew, one of the other artists, sitting for us. 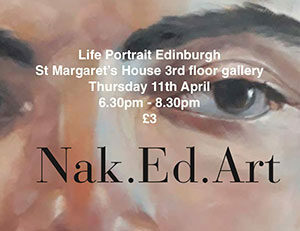 Infact his portrait features in the exhibition and also on the Nak.Ed.Art flyer. 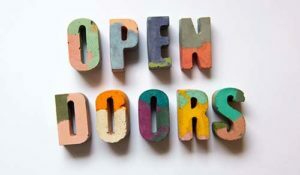 Spring Open Doors – yes, this is happening! 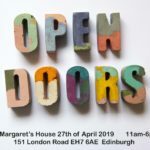 We are planning a St Margaret’s House Open Day on Saturday 27 April 2019. Like last year, the spring Open Doors event will take place on just one day. We will invite the public via our communications to St Margaret’s House from 11am till 6pm on Saturday, 27 of April. You can organise a special taster session of your classes, have a temporary exhibition, or simply open your door while you’re working or meditating or yoga-ing! We had more than 1000 people pass through the building doors last year and are expecting similar interest this year too. The Open Day is an amazing opportunity to share the creative diversity that defines St Margaret’s House community. “Yes I want take part and open my studio” and we answer “that’s brilliant!”. We will distribute fliers, but will not publish a detailed printed programme before the event. Instead, the programme will be shared online the week before the event and a printed version will be available for visitors on the day. Please remember, you MUST have your own Public Liability Insurance (through your A_N membership or similar) and updated risk assessment form by 27th of April. I’m Calum MacDonald and I run Gibbet FX which specialises in the creation of models, props and Special FX work for film, TV and theatre. 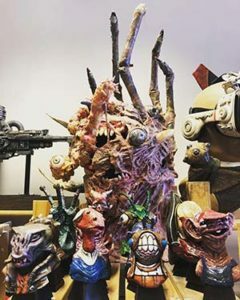 I’ve been working in this field for the last 15 years having originally trained in stop-motion animation before venturing into the varied environs of SFX. It’s the appeal of creating the unusual and the weird and wonderful that drives me and I’ve had the pleasure of working for clients who want something “a little bit different”. Life-sized dinosaurs, huge gargoyles, trauma injuries – no two projects are ever the same! I also felt that while learning my craft, there seemed to be a lack of training opportunities within this field particularly in Scotland, so I decided to start running training courses from my studio for those who had an interest in developing their skills in these particular areas. 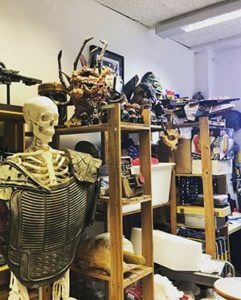 The courses cover a wide range of different topics from Special FX makeup and prosthetics, sci-fi and fantasy prop and model making to creature design. 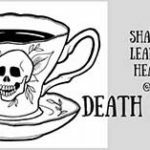 Courses vary in length from 2 days – 6 days and are suitable for all levels of experience. For more information visit the Gibbet FX website or follow us on Facebook. Owen Normand is a Scottish contemporary painter who studied at Edinburgh College of Art. 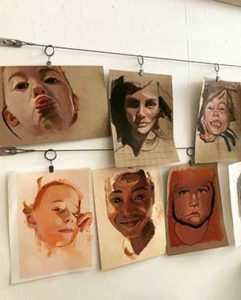 His style can be described as expressive realism, where both observation and creativity play key roles. 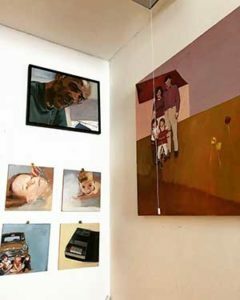 He paints figurative work and still life; the key focus of his work is to explore an awareness of impermanence and an empathy towards the inevitable passing of all things.